Curt Labitzke, Associate Professor in the Art Division, first visited Italy in 2002. Little did he know what a major part of his life that country would become. By December of this year, he will have led or co-led five quarter-long Studio Art Programs in Rome (SAPR) and three month-long Exploration Seminars in Tuscany. The “Tuscany: A Creative Journey” Exploration Seminar was developed in partnership with Cynthia Caci, Assistant Director for Academic Services in Digital Arts and Experimental Media at the University of Washington. 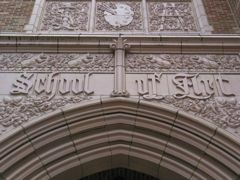 The Labitzke and Caci families have been friends for nearly twenty-five years, and Caci received her MA in Art History from the School of Art in 1996. 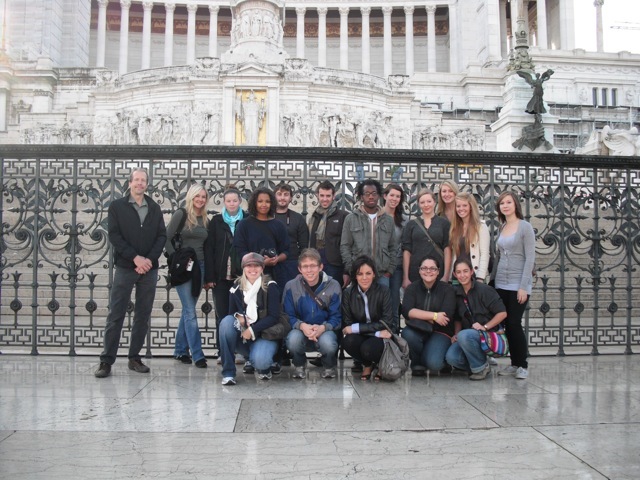 This program is based primarily in Florence, but there are also field trips. 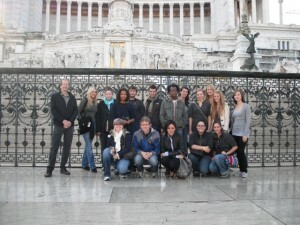 This year, for the first time, the group will spend five days in Rome at the end of the program. One difference between this program and SAPR is that the Exploration Seminar is open to any student at the University of Washington. This makes it much more interdisciplinary in nature, and, even though no art making background is required, it is a hands-on creative experience. Professor Labitzke feels that the best part about teaching is working with and being around the students. Teaching abroad allows him to do that in a more intensive way. He says that the groups become very close because they work, travel, eat, and shop together. One typical group activity for the SAPR programs he leads is a potluck dinner every Sunday. Some groups maintain that closeness even after they return from Italy. Many members of his SAPR group from last year continue to gather once a week for a shared meal, and they had a reunion in August 2010 that was attended by nearly all participants. His wife and children have been able to join the groups in Italy at various times, often sharing the life-changing experiences of the students. 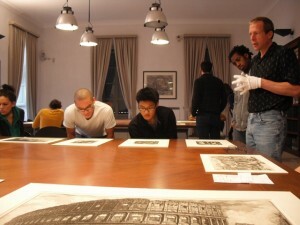 Both Professor Labitzke and the students benefit tremendously from seeing original art firsthand. He says, “There is no substitute for seeing art in person.” He feels that, with every program, he learns as much or more than the students do. That learning has influenced both his teaching when back in Seattle and his own artwork, whether created abroad or at home. His work has been especially influenced by the portraiture and the immense sense of time conveyed in the art he has seen in Italy. Last year, while in Rome, he created pieces that involved layering posters removed from building walls, carving portrait heads into the thick surface. More recently, he has made still life prints that reference the pietra dura stone inlay work found in Florence. A new European experience is on the horizon for Professor Labitzke, and he is looking forward to the challenge with trademark cheerfulness. 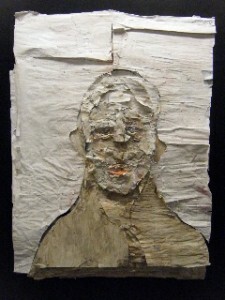 During Spring Quarter 2012, he will lead the first Studio Art Program to Leon, Spain. He had an opportunity to visit the University of Washington’s newly inaugurated Leon Center last autumn, and he says it is “an amazing sixteenth-century palace restored to historical perfection, a most inspiring space.” He will use SAPR as a model for the Spain program, with a focus on the art of Leon, Madrid, Barcelona, and Northern Spain. Perhaps, by the end of this decade, Spain will be his new second home.